History | Birkebeiner Nordic Ski Club Inc. The Birkebeiner Nordic Ski Club was formed in September 1977, in Mount Beauty Victoria, when a small group of enthusiasts met at the home of Paul and Helen L’Huillier to discuss the idea. It is a small but very active and progressive north-eastern Victorian based club located in Mount Beauty, 350km from Melbourne. 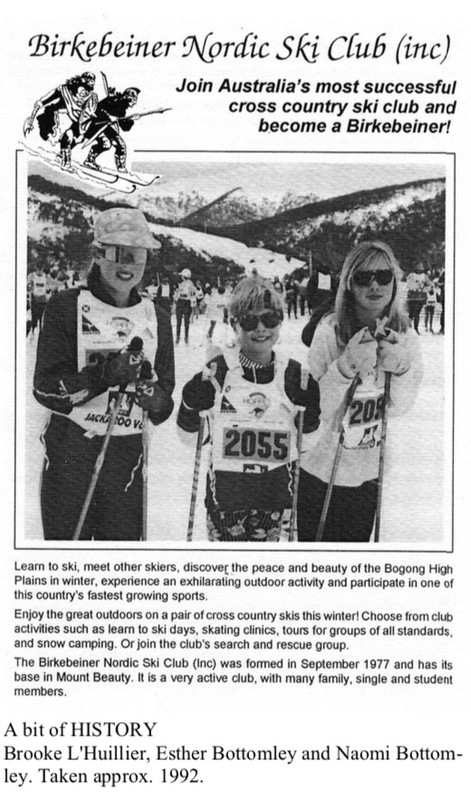 Since 1977 it has conducted many activities and programs for its members and other cross country skiers centred on the Falls Creek Ski Resort, Alpine National Park and the Bogong High Plains. To promote the development of cross country racing, ski touring and associated activities. To provide for its members the opportunity for the enjoyment of skiing. To associate with other organisations with similar objectives. To assist in searches for persons lost in bushland areas of the state and to maintain a Search and Rescue group. 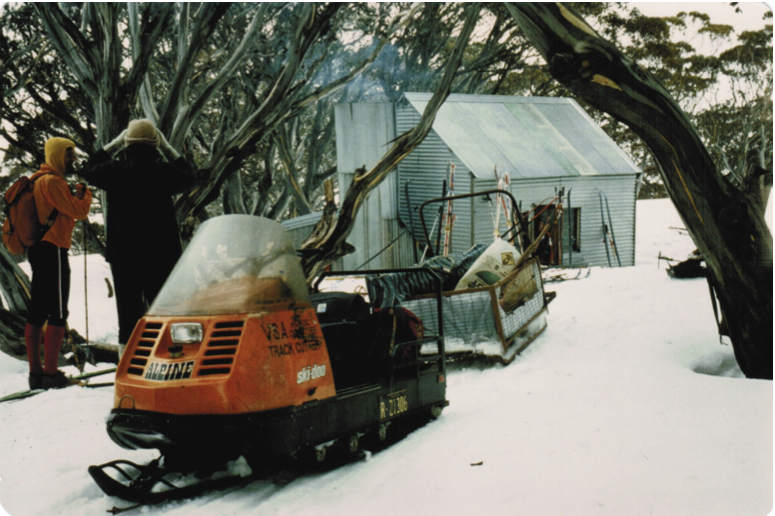 Awarded the Ski Club of the Year in 1991 and 2002 at the Annual Skiing Australia Awards. Construction of a Clubhouse above Windy Corner Falls Creek in 1996. Six Winter Olympic Games skier representatives. In 1997 it won the inaugural Victorian Interclub Series. Gaining Worldloppet accreditation for the Kangaroo Hoppet in 1991 with assistance from Skiing Australia and support from a number of government agencies. Conducting all 26 Kangaroo Hoppets since 1991. Conducted major social functions for the 20th (1997) and 30th (2007) anniversaries of the Club. 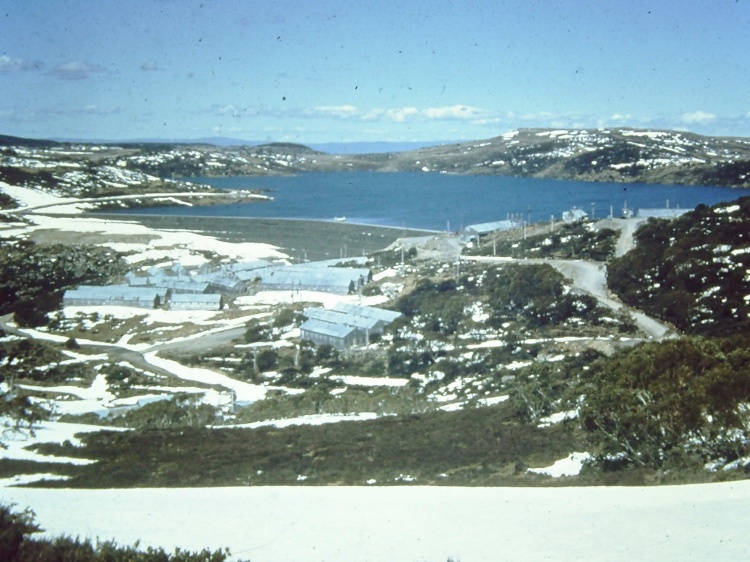 Was instrumental in acquiring and placing the Jack Heberle Race Hut in the Nordic Bowl at Falls Creek. Over the years has contributed labour and expertise to the planning and development of the trail system at Falls Creek. Recognised for its organisational ability to conduct State and National Championships. Initiated an Overseas Coaching Program – since 2011 the club has invited an overseas coach for the winter season to assist with club (junior & adult) and school coaching. There was civil war in Norway. Faction pitted itself against faction, each having a pretender fighting for the throne and the supremacy of the country. Father fought son, brother against brother. No one felt safe. (One faction was the Birkebeiners—the underdogs who were persecuted and victimised. Living out in the open these people were in such dire need that they had nothing but the bark of birch trees as footwear. The word Birkebeiner, (literally “birch legs”), has come to mean a person strong in adversity, never daunted by trials and hardships. The chieftain of the Birkebeiners, Sverre, had gained ascendancy over great parts of the country, but the rival faction, the Baglers, prevailed in the Oslo area and in the more affluent eastern parts of the country. Under Sverre’s son, Haakon, the conflict subsided, but the fighting flared up again when Haakon died in 1204. Haakon’s son, Haakon Haakonsson (the little prince), was born a couple of weeks after the death of his father, and in him the Baglers saw a dangerous rival pretender. The Birkebeiners knew that the life of the young prince was at stake and decided to take him north to Trondheim where he would be safe. On Christmas Eve the party of refugees came to a small farmhouse in Lillehammer, where they stayed in hiding over Christmas. Early in January 1206 they set forth again. Finding it risky to follow the route up the Gudbrandsdalen valley to Trondheim, they cut across the mountains to the neighbouring Osterdalen valley. Due to bad weather and difficult snow conditions the two best skiers,Torstein Skevla and Skjervald Skrukka, had to go ahead and leave the rest of the party behind. Never flinching, the two of them carried the child, in whom they had high hopes for the future of Norway, across the barren mountains to Rena in the Osterdalen valley, a distance of 55 km. There they were well received by local farmers and given horses and food for the further escape north to Trondheim. Haakon Haakonsson eventually became king (1217-63), ended the civil war and established peace in the country. Under him Norway enjoyed its heyday in the Middle Ages. On this trip they suffered much from cold, snow and wind. Behind the saga lies a deed of valour and strength with an appeal to skiers of all ages and nations. Their deed is celebrated today with the annual Birkebeiner races in Norway (55 km), USA (50 km) and Australia (25 km). The first Norwegian Birkebeiner race was held in 1932 (155 skiers), the American Birkebeiner 1973 (70 skiers) and the Australian Birkebeiner in 1979 (80 skiers). Note: See below for an explanation and photos of where the course went and how the track was made in those early years. The 5.5 kg pack carried by the present-day Birkebeiners (now only in the Norwegian race) symbolises the weight of the 18-month-old prince. The idea is that it should contain the necessities for rough mountain weather. As in all races some skiers compete for a top placing, but it is a feature of this race that the ultimate goal of every participant is to finish inside a time limit. Those who succeed are awarded a pin, considered the hallmark of a skier. The time limit in each age group is made up on the basis of the average of the time of the 5 fastest (3 fastest in the Australian Birkebeiner) skiers in an age group, plus a time increment of 25% added. Both the Norwegian and American Birkebeiner races are foundation members of Worldloppet, which was established in 1981. The Australian Birkebeiner is not part of Worldloppet but the Kangaroo Hoppet, which developed from it, was admitted in 1990 with the first event being conducted in 1991. Note: The Australian Birkebeiner is still conducted as part of the Australian Worldloppet event but done in the skating technique, no pack is carried and a pin is awarded to all those who complete the distance regardless of time. The 2017 event on will be the 27th Kangaroo Hoppet. How it was done — Two skidoos were used. Front skidoo towed a trailer with all course marking gear (mainly flags) plus drink station supplies including water. The second skidoo towed a track setter that put in the classical tracks (no skating in those days). Behind this second skidoo was towed a skier (Gerry in the photo above) for the purpose of smoothing out the set track. The 25 km course started on the north side of the Dam Wall, went out to Watchbed Creek then up the Nelse Track to Fitzgeralds Hut (drinks), back through The Park to Edmondson’s Hut (drinks) then back over Heathy Spur. It finished in the Nordic Bowl. It was done in the classic style and all skiers had to carry a 5 kg pack (symbolising the weight of the 18 month old prince Haakon of Norway) which was weighed when they finished. Norway’s gruelling 56km Birkebeiner tour race is the Lauberhorn of Nordic skiing but most Australians know little about it until March, 1979, when Colleen Bolton scored second place in the women’s class. 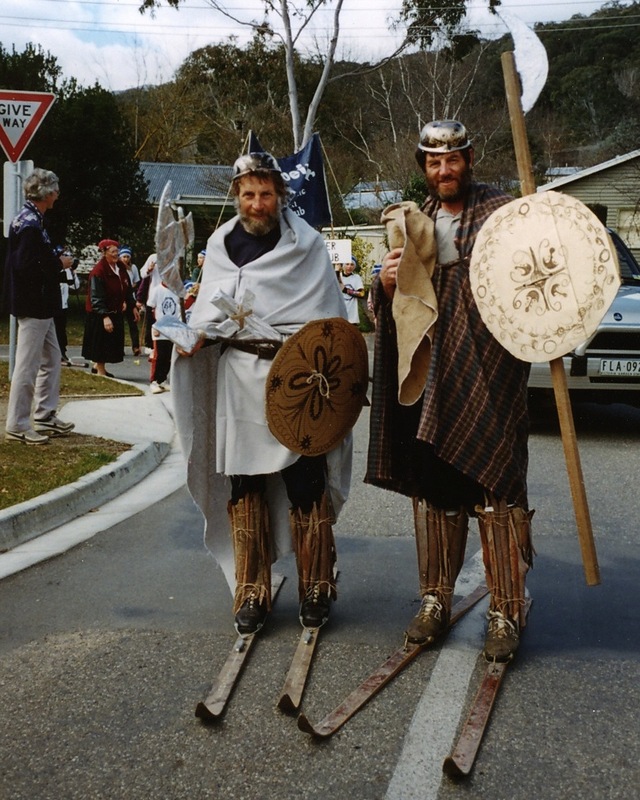 Then on September 16, at Falls Creek, the first Australian Birkebeiner was staged by the Birkebeiner Nordic Ski Club. The Australian course was only 25km long, but like their overseas counterparts, the local contenders all carried the traditional 5kg pack. The name “Birkebeiner” originated during the 13th century, when Norway was torn by civil war between two factions, each with a pretender to the crown. The smaller faction, consisting mainly of poor people, was often on the run, its members forced to live out in the open. These people were in such dire need that they wrapped their feet in bark torn off birch trees. Thus they were nicknamed the “Birch-legs”. 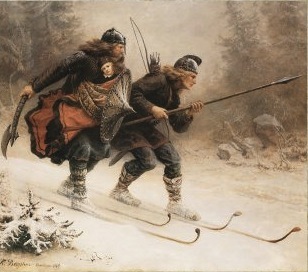 When their 18-month-old Prince Haakon was pursued by the enemy in January 1206, two of the best skiers among the “Birch-legs” brought the little child in safety over the Lillehammer Mountains. Later, Haakon became king, established peace in the country, and under him Norway enjoyed its heyday. Now, every year, on the third Sunday in March, Norway commemorates this historical event with the “Birkebeinerrennet” (Birkebeiner race), the 5kg pack carried by contestants representing the weight of Prince Haakon. Members of the Birkebeiner Club spent an uneasy night on the eve of the first Australian Birkebeiner. The track for the race had taken all Saturday to prepare and the weather prospects were not good. Early on the morning of the race, threatening clouds billowed in, driven by a stiff breeze. With this threat hanging over their heads, 90-odd participants made their way to the Rocky Valley Dam wall, anxious not only about the weather, but also their ability to race 25km – a distance which to many usually means a full day’s tour. Adding to this doubt was the load of a 5kg pack to be carried by young and old. Scales were available before the race to check the weight, but the packs were officially checked at the finish. The start (on the east side of the Dam wall) was ideal, 150 metres wide, and slightly uphill, with about 250m before the tracks converged into a mere two grooves, which were then followed for most of the course. From that point on, it was a typical tour race scenario. The race has settled down by now, the finishing order being more or less established for the first dozen or so. Aching bodies flog themselves up Watchbed Creek Road, paying the penalty for a fast start. Once at the top, It’s a beautiful ski across the plains into Fitzgerald’s Hut where the drink station attendants are caught off guard, having themselves skied in before the race and taken a little longer than anticipated. But they cope very well, and most are grateful for a drink at this stage. With the leaders battling out the places, the minor skirmishes are shaping up back in the field. The men are trying to beat the women. The wax skis out-glide the non-wax, but slip uphill. Packs make their presence felt, and straps break, testing ingenuity with the question of repair – in a hurry. Hasty repairs don’t last distance, however, and some stop four times with “pack distress” – a new dimension in tour racing. For others, enjoyment is the object of the trip, and all is well at Edmondson’s Hut. But them, the climb up Heathy Spur begins. By this time, the weather is quite warm and the snow has that porridgy consistency. At the top of the climb, it’s a straight run home, or it usually is. Alas, the track-setters, in order to give everyone their full quota of enjoyment, have snaked the course back to the Dam so that the usual three or four kilometres are lengthened to six or seven. But the weather has improved, making the views towards Feathertop, Fainter etc., superb. The descent to the dam lacks the excitement of an icy day, and most get down without a slip. A cruel finale though, is the climb out of the creek below the dam wall up to the observation point – a steep herring-bone followed by a steep uphill ski, or walk in most cases. Through the finish line, then a pack weigh-in, and who would havethought anyone would voluntarily carry 6.5kg? Yet there are more than a few over the mark. Much discussion concerns the contents of the pack. Beside the compulsory parka and windproofs, “I’ve got rocks”, “a packet of nuts and bolts, “sand”, “a large bottle of water”, “dirt”. At no other time in the history of the High Plains has so much junk been carried for 25km on skis by so many people. Victorious is Lauri Jortikka (Vic) who virtually led from the gun. 17 places behind is Robyn Rodd (Vic), the first woman. A total of 83 skiers finish the course. The race was a huge success, but not without a considerable number of people unselfishly giving up their time at the various check-points and drink stations. They all skied out to their positions before the race, carrying much more than a 5kg pack in some cases, then skied the remainder of the course, checking to see that no skier came to grief. The thanks of all competitors go to these people. Note: The 1991 International Kangaroo Hoppet Worldloppet Ski Race originated from this first Australian Birkebeiner.